The front axle nut is 22mm. What are folks carrying with them on the bike to remove the nut on the roadside or trail? I want to get a combo tire lever axle wrench like the Motion Pro T6 or Tusk, but it looks like there may not be enough clearance for it. The fender is very close to the nut, and is a welded post. Does anyone have the combo lever, and is there enough clearance? 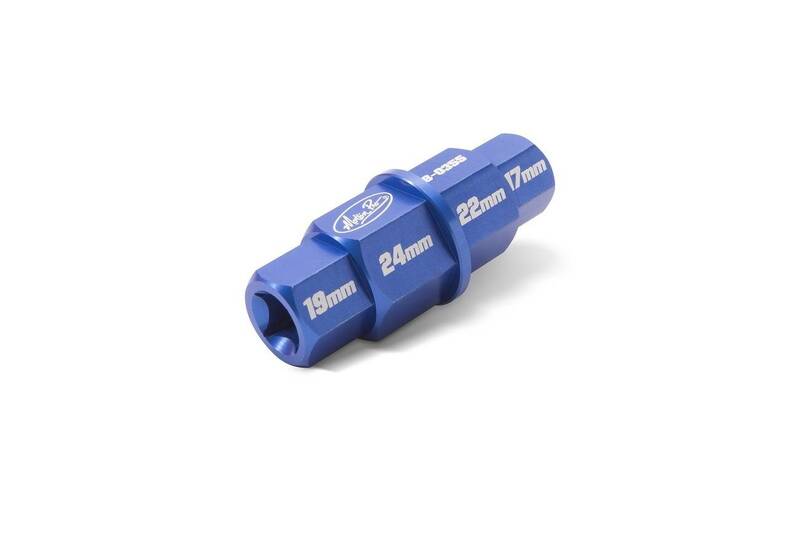 I have a 1/2 inch drive 22 mm socket that I use in the garage, but would prefer not to carry it. I have a new AT and am currently putting together my tool kit. I purchased a combo 27mm/22mm tire lever/axle wrench set and indeed, the front wrench will not fit because of clearance issues. My current plan is to carry the 22mm socket. I am looking at a lockable Givi S250 tool box which will mount inside my Happy Trails pannier bracket on the side opposite the muffler. Between the S250 and a tool belt I should be able to ride with everything I need (including both 18" and 21" spare tubes, CO2 inflation kit, tire irons, a compact jumper battery and an assortment of tools). I prefer not to mount panniers when I am headed out for technical riding and this will let me do that. The Motion Pro tyre iron / wrench combo work well. I have the 32mm with insert (27/22) and the small 12mm as a pair. The 12mm works on pinch bolts, the other on both front and rear axle. You have to understand- you aren’t getting the front wheel off without removing the 4-lower 5mm hex fender bolts. This gives ample room for the motion pro tool on the front axle. Then, or you don’t mind a small disc scrape, you can rotate the lower sliders enough to get the tyre past the brake calipers. Best if tyre is deflated then no scrape. Manual says to remove caliper. Makes it easier but not necessary, especially if it’s a roadside flat repair. If you do remove ONE caliper, use blue loctite when reinstalling. No need for new bolts as specified in manual. Easier and cheaper to remove the two left side lower fender mount screws. Try removing your front wheel. You either remove one caliper or twist the lower legs to allow the tyre past the calipers. And to twist the lower legs you have to remove the fender screws. You quick realize access for the motion pro tyre irons is not an issue if you think ahead. Motion Pro tools work well - I have the Rugged Roads fender riser, so I didn't even know there was any kind of clearance issue. 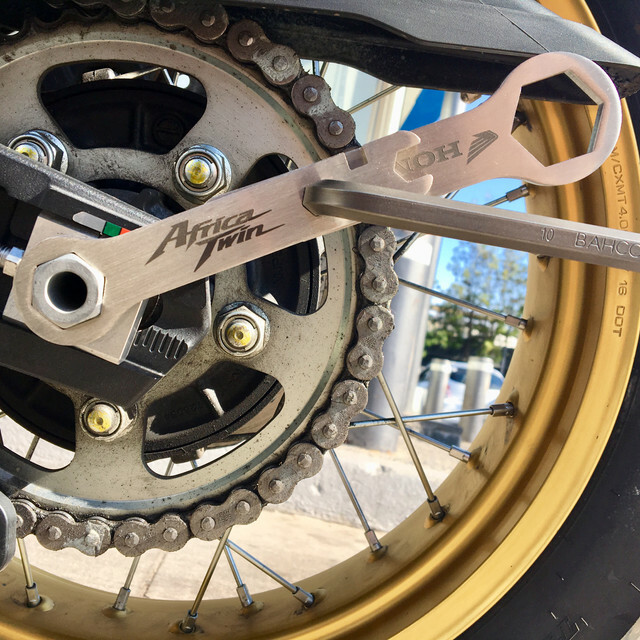 I use the stepped Motion Pro 12/13 wrench for the pinch bolts (it's a tapered wrench that seems to work better on those bolts). I also use the axle tool for the other side to help remove the axle without banging away on the threaded side. jays0n, jamnut and MPNM like this. How about the following + spoon lever combo? Together they barely weigh anything. supasim1 and MPNM like this. Do you guys then use a torque wrench to tighten everything properly once you get home/to a garage or you just tighten the **** out of it and hope it's ok? Because then wouldn't it be more cost effective to just buy a torque wrench and the 27/22 bits and travel around with those while touring? A torque wrench is far too heavy to be riding with. IMO they are for people who tend to over-tighten. I install my wheels with the tools I carry on the bike, no need for a lot of torque. I will be able to get them off in the field with those tools if I need to. black99S and MPNM like this. Re & re the front wheel at home. 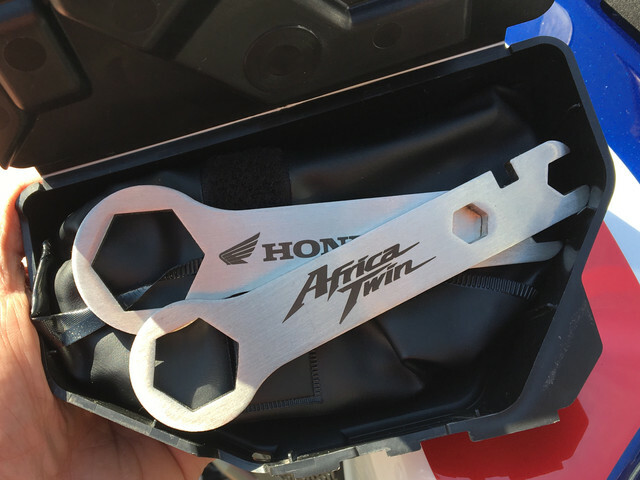 Use your road tools and tighten as you think appropriate, then check with torque wrench so you have an idea if you went too tight. Not a good idea to tighten the sh!t out of the bolts. Easy to strip things. It's more important to get the fork legs aligned properly so you are not stressing the bushings and seals. Miked6631 and MPNM like this. 2 Attachment(s) You Euro's are lucky!